The windshield wipers and washers can be used when the power mode is in ON. Sprays while you pull the lever toward you. When you release the lever, the wipers make two or three more sweeps before stopping. Do not use the wipers when the windshield is dry. The windshield will get scratched, or the rubber blades will get damaged. In cold weather, the blades may freeze to the windshield, becoming stuck. Operating the wipers in this condition may damage the wipers. Use the defroster to warm the windshield, then turn the wipers on. 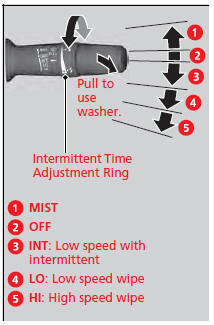 If the vehicle speeds up while the wipers are operating intermittently, the length of the wipe interval shortens. When the vehicle starts moving, the wipers make a single sweep. When the vehicle speeds up, the wiper operation’s shortest delay setting and the LO setting become the same. Turn the washers off if no washer fluid comes out. The pump may get damaged. The wiper motor is equipped with a breaker that may stop motor operation temporarily to prevent an overload. Wiper operation will return to normal within a few minutes, once the circuit has returned to normal.